Garlic and lemon are standard items in many American kitchens, but only some people realize the many health benefits offered by these products. Though both foods have been associated with lowering cholesterol, only lemons have been shown to have a significant effect in this area. Several studies claim that garlic is capable of lowering cholesterol and thinning the blood. Unfortunately, several researchers at the University of Exeter who re-examined these studies years later found them to be insufficient for making such claims, ABC News has reported. Medline Plus agrees that the studies that propose this association between garlic and cholesterol are of low quality by scientific standards. A 2007 study at Stanford University confirmed that garlic has no significant effect on cholesterol levels, whether taking in supplement form or eaten raw, explains the National Center for Complementary and Alternative Medicine. Garlic offers many other health benefits despite its inability to affect cholesterol levels. Raw garlic may be able to prevent colon cancer, breast cancer and prostate cancer. Garlic eaten raw or taken as a supplement may also be able to prevent high blood pressure and the hardening of the arteries, says Medline Plus. According to "Reader's Digest," lemons are packed with vitamin C. When consumed, the vitamin C acts as an antioxidant, which makes it more difficult for cholesterol to stick on artery walls. In addition, lemons contain a terpenoid known as limonene. This compound contributes to a lower risk of heart disease by making significant reductions in total and LDL cholesterol levels, says Vegetarian Nutrition, a dietetic practice group of the American Dietetic Association. As a citrus fruit, lemons possess a significant amount of potassium, pectin and folic acids, all of which are essential to human health. The phytochemicals in these fruits also have anti-tumor and anti-inflammatory properties and may prevent blood clots, says Vegetarian Nutrition. More specifically, lemon rinds may strengthen vein and capillary walls through the compound rutin. This can lessen the pain and discomfort associated with varicose veins. 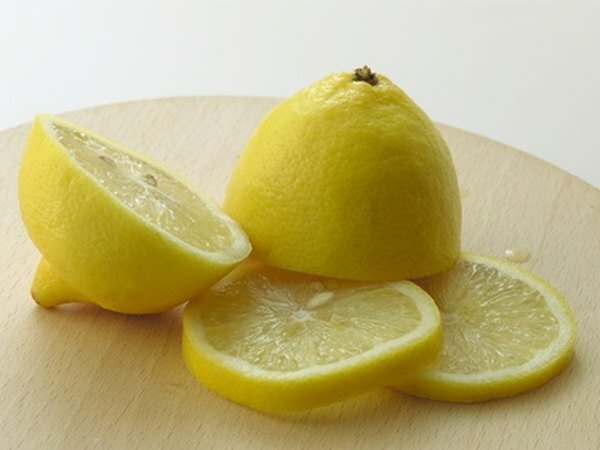 Lemon juice also has citric acid, which "Reader's Digest" explains is an effective way to prevent kidney stones. Garlic has the potential to increase bleeding, so anyone planning to undergo surgery soon should avoid eating this food. Children should not ingest garlic supplements, and women who are pregnant or breastfeeding should see a doctor before taking garlic pills. Garlic also has the potential to cause digestive problems, heartburn, gas or nausea, says Medline Plus.